We recently had the chance to review several items from Swanson Health Products! About Swanson Health Products:"Swanson Health Products sells discount vitamins and supplements, organic foods, natural skincare products, homeopathic remedies and more at the lowest possible prices. From old favorites like vitamin D, fish oil and weight loss supplements to health food products like organic coconut oil, you won’t find a better value anywhere else. In fact, we guarantee it—we guarantee our prices, our service and our quality. So start shopping and enjoy the savings. Dr. Woods Pure Black Soap with Organic Shea Butter promotes healthy skin. Black Soap gently cleanses and exfoliates skin to reveal healthy, radiant skin. Exquisitely rich, yet gentle, Black Soap soothes, moisturizes and conditions your skin with shea butter while it cleanses. It leaves you thoroughly clean and feeling fresh. This formula may also be used as a conditioning shampoo, body wash, soaking bath and household cleanser. Contains no lauryl/laureth sulfates, animal ingredients, no artificial colors and was not tested on animals. pH balanced. Paraben free. Men and women alike will enjoy Alba Moisturizing Shave Aloe Mint! This unique formula delivers a smooth and soothing shave with lasting comfort thanks to jojoba, vitamin E and organic botanicals. This hydro-active cream delivers ideal protection against drying, while maximum absorption of water lifts and softens unwanted hair for effortless razor glide, thus reducing the risk of nicks and cuts. This formula features 100% vegetarian ingredients, is paraben free, and is not tested on animals. Be natural and stay fresh with Naturally Fresh Deodorant Crystal Stick! This unique formula features aloe vera and is ideal for men and women. It is hypoallergenic and paraben, PG and fragrance free and contains no harmful aluminums. 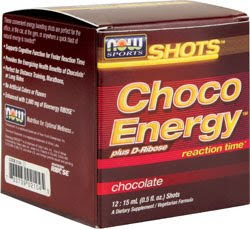 Awaken your senses with NOW ChocoEnergy - an invigorating blend of vitamins, minerals, and other natural ingredients that work together to deliver a powerful boost of extended energy! In addition to its perfectly balanced combination of B-12, Bioenergy RIBOSE, NAD, and Chromium Chelavite, ChocoEnergy delivers Yerba Mate, a natural source of caffeine and polyphenols, as well as Chocamine, a proprietary cocoa extract that provides the energizing benefits of chocolate without the fat. Together, this unique arrangement of naturally energizing compounds works synergistically to quicken reaction time through its effects on cognitive function. 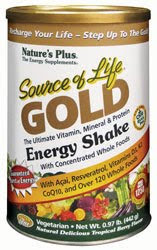 Nature's Plus Source of Life Energy Shake is the ultimate vitamin, mineral and protein shake with concentrated whole foods. This unique formula features acai, resveratrol, vitamin D3, vitamin K2 and CoQ10. With over 120 whole foods, this product is guaranteed a burst of energy. Alba Coconut Milk Facial Wash is abundant with natural fatty acids to help gently remove impurities without drying sensitive skin. Rinses clean for a soft, smooth complexion. This formula features 100% vegetarian ingredients, is paraben free, and is not tested on animals. Mighty Tasty Hot Cereal from Bob's Red Mill is a hearty and healthful way to start your day. Made from whole grain brown rice, corn, sorghum, and buckwheat, it delivers all the nutritious components of the grains themselves: the germ, the oil and the fiber. This gluten free cereal is a delightful way to get your energy level up and keep it there all day long. Bob's Red Mill products labeled Gluten Free are milled and blended in our dedicated gluten free mill room, packaged in our dedicated gluten free packaging room, and batch tested in our dedicated gluten free quality control laboratory, and then confirmed by ELISA Gluten Assay tests." What we thought: Wow! Swanson Health Products carries a ton of stuff to get you on track for living a more healthy, natural life. Seriously the variety is quite astounding:) We were given a sampling of Swanson Health Products to review. My personal favorites were the Alba products. The shave cream was wonderful and thick and left smooth soft results and the Coconut Face Cleanser worked beautifully as well. Both Alba products smelled absolutely divine:) B enjoyed the energy boost he got from the Now Shots. I found it quite interesting that the Pure Black soap could be used to clean your house as well as your body and the kiddos enjoyed our sweetened version of Bob's Mighty Tasty Hot Cereal. Overall, the most impressive thing about Swanson Health Products is the amazing variety of products they offer and the affordable prices at which they can offer them. ABCD Diaries gives Swanson Health Products an A! Buy It: Find these great healthy and beauty items at Swanson Health Products ! Win It: Swanson Health Products has generously offered one ABCD Diaries reader a $10 Gift Code! To enter, follow our blog via GFC and comment below. Giveaway ends Monday, March 27, 2011 at 11:59cst. Winner will be chosen via random.org and emailed. They will have 48 hours to reply. Open to US residents 18+:) No PO Boxes. ***Are you interested in getting some free Swanson Health Products goodies to review on your own blog? Then check out the Swanson Health Blog for all the details. Entered for 34 Degrees Crispbread. Entered the Gold Canyon Giveaway. I like Swanson Health Products on FB (Laura Hulke Wales). Like SwansonVitamins on Facebook-pamela j.